Schizophrenia, a mental disorder characterized by a breakdown of thought processes and by impaired emotional responses which common symptoms include delusions, such as paranoid beliefs, hallucinations, disorganized thinking, and negative symptoms, such as lack of emotion and lack of motivation, causes significant social and work problems. Diagnosis is based on criteria in either the American Psychiatric Association's fifth edition of the Diagnostic and Statistical Manual of Mental Disorders (DSM 5) (used in the United States), or the World Health Organization's International Statistical Classification of Diseases and Related Health Problems (ICD-10) (typically used in European countries) using the self-reported experiences of the person and reported abnormalities in behavior, followed by a clinical assessment by a mental health professional. 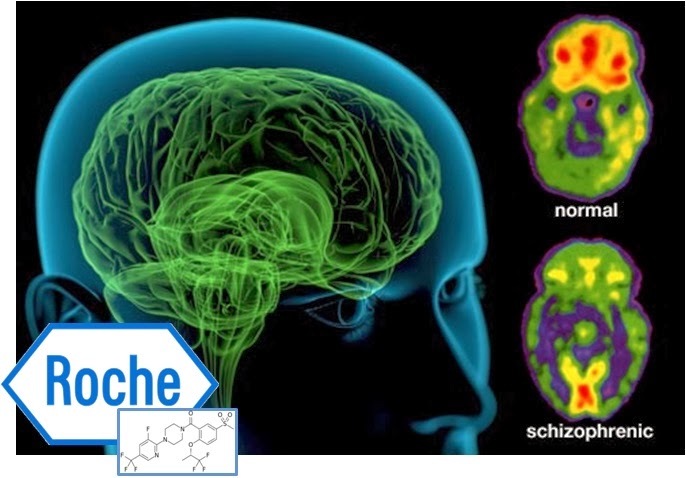 Antipsychotic medication is at this moment the first-line psychiatric treatment for schizophrenia, however, it fails to significantly ameliorate the negative symptoms and cognitive dysfunction. In those on antipsychotics, continued use decreases the risk of relapse. There is little evidence regarding consistent benefits from their use beyond two or three years. Roche announced recently that its Phase 3 drug for schizophrenia, Bitopertin, has failed two phase 3 studies. Bitopertin, studied to determine if it can help schizophrenia patients with their “negative” symptoms such as lack of emotion and poor social skills, had the same effect as placebo after 24 weeks in the first two completed studies but this is not shocking because negative symptoms are notoriously difficult to assess. This is one of the reasons why Roche is conducting numerous studies simultaneously. The other is that due to the aforementioned placebo effect you often need to run multiple trials in order to generate two statistically significant positive trials necessary for FDA approval. So, even if those results are disappointing, they are not necessarily fatal for the drug’s potential approval. As we have previously published it wasn’t that long ago that companies would not even consider revealing failed data at this point in the clinical program. Rather, a company would wait until all six programs were completed and a full assessment of the trial results were available before making them public. Fortunately the publication of such results in drug trials is becoming less significant, especially by the most important pharmaceutical companies. Most of them are registered in clinicaltrials.gov and their evolution can be followed by the patients participating in the studies contributing to greater transparency in the drug R&D process. That’s a great benefit for patients, physicians and payers, and will undoubtedly help pharma companies’ reputations as well. Wondering why the compound passed phase II then ?